Bouldering is a style of rock climbing. Sport England describes rock climbing as one of the greatest challenges of human strength, skill and endurance and one of the most rewarding sporting activities. Traversing around our Bouldering Wall is fun, exciting and challanging. Can you get all the way around without putting your feet on the floor? Harnesses are not worn for bouldering as climbers do not venture far from the ground. Our Mobile Bouldering Wall (also known as a Traversing Wall) is 9m long, 2m wide and 3m high which gives 70m2 of exciting and challenging bouldering. The wall consists of flat surfaces and overhangs providing a challenge for all climbers whether they are climbing for the first time or an experienced rock climber. If you wish to use the Bouldering Wall as part of a longer session with a small group, we can also use our Bouldering Wall to play a number of fun and challenging games suitable for all ages and abilities of climbers. We are flexible and will recomend how best to use the activity for your event. Our Mobile Bouldering Wall is suitable for all types of events and almost anyone can participate. 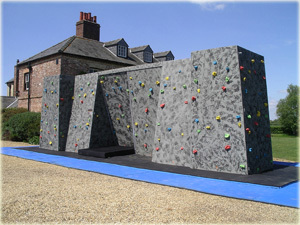 The Mobile Bouldering Wall can be used for fun days, team building, extreme sport activity days and many more events. 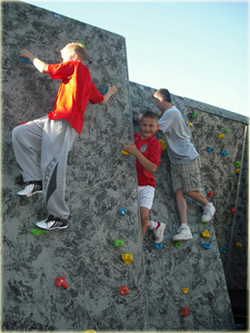 The Portable Bouldering Wall can be set up on a firm flat surface (grass or hard standing). The Portable Bouldering Wall can also be used indoors providing we have very good access into the area where the activity is required. If you are thinking about hiring our Bouldering Wall for use indoors please discuss this with us. To ensure an exciting but safe experience, climbers are restricted to taking their feet no higher than 1.5m from the ground and a full skirt of safety mats are always used. We always provide staff to supervise our Bouldering Wall to ensure the activity is run smoothly and safely for your event. Our staff are fully trained, hold enhanced CRB Disclosures and First Aid trained team member will be present at your event.